I briefly wrote in The Allure of Nymphets about 45-year-old Charles Dickens’ thirteen year affair with 18-year-old Ellen “Nelly’ Ternan. Their affair began in 1857 when Ellen was an actress in a play that was produced by Dickens. In an effort avoid tarnishing his image and to keep their affair a secret, Dickens bought a house for Ternan close to London. On one of his secret visits, Dickens impregnated the nymphet and they had a son that they hid even further away in France. The British film The Invisible Woman (2013) is showing here at the 51st New York Film Festival. 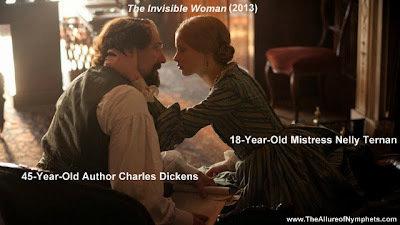 The film must be based on the paperback, The Invisible Woman: The Story of Nelly Ternan and Charles Dickens by Claire Tomalin. I think I'm going to wait until the film comes out on DVD, because I would be frustrated with not being able to share any clips with readers of the blog; however, the problem is that according to IMDB, the movie isn't going to be released until February 2014! At that time or hopefully sooner, I'll do a review and compare and contrast of the film and paperback.